OCEAN provides Shelton release devices at NO CHARGE to you upon request. You can learn how to use these devices by viewing a detailed instruction video here (link). These devices are also distributed at the Saltwater Sportsmen’s Show at NO CHARGE and volunteers provide live demonstrations on how they work. 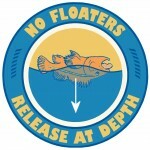 Remember – the goal is No Floaters.